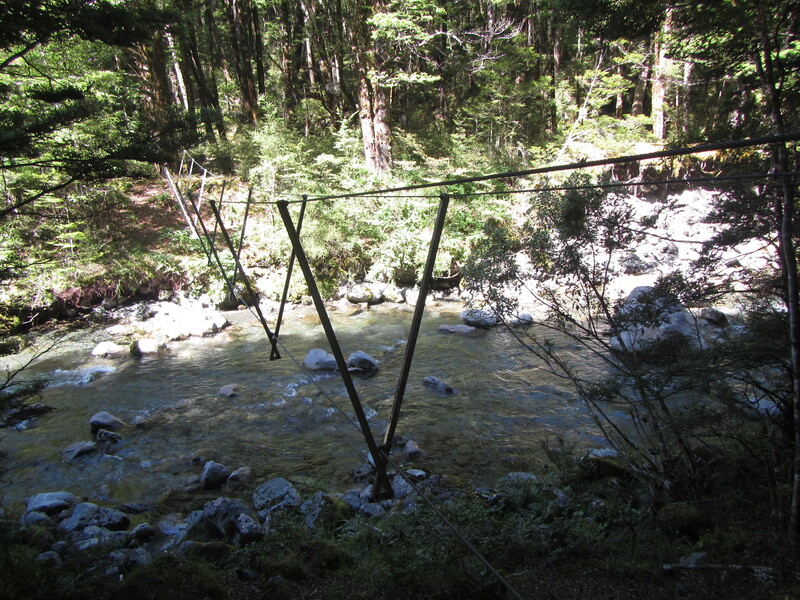 Immediately from the hut there was a river crossing over the Kiwi River. Hmm…. Shoes on our off? It was early morning, around 6:30am and the grass was wet. From previous experience I knew that shoes would be saturated just from dewy grass alone, so I left my shoes on and crossed. I think by now this was day 4 or 5 with wet feet. For 3 kilometres from the hut the trail followed the valley floor through grass towards Kiwi Saddle and Lake Summer. From Kiwi Saddle it was back into the beech forests but a much rougher track. Lots of roots, rocks and more scrambling up and down. It was all the same to me having walked through so much similar country to date and basically just head down and chipping away at the distance. A work day if you like, just going through the motions working from hut to hut for the day. I got to Hurunui Hut just before noon and decided an early lunch was in order. But on entering the hut and meeting one NOBO walker from the US I resolved to keep it a short lunch and move on quickly. I’m not in the habit of dissing other trampers but this guy was an absolute wanker and needs to be called out. He was in the middle of lecturing other trampers in the hut, clearing seeing the world through a single lens and only recognising one correct way for trampers to walk the Te Araroa, his way. Almost to the point of being evangelical, he was telling other people that that if you havent walked every step, you are not a thru hiker and have no right to call yourself one. He then goes onto to say that the TA trust has it all wrong in having hazard zones as well, in that if the walk is stop/start its not a thru hike. So this guy loves telling people how he has walked continuous steps from Bluff heading north, including crossing both river hazard zones – good on you mate but dont bag others for not doing them. Now these are hazard zones for a reason, they are dangerous rivers to cross. His guy then goes on to say that in crossing the Rakaia River he lost 30 metres by being swept down stream and he is a solid hiker having completed the PCT in the states. Great advice buddy, get everyone to cross the hazard zones just to make sure they are ‘thru hiking’ and increase NZ’s river drowning rates you numb skull. Hike your own hike and leave others to hike and enjoy theirs as they see fit. Enough of this. I digress from my blog. Perhaps this rant is a sign of me being very comfortable on the trail now to the point that my hierarchy of priorities has changed. All aspects of camping, eating, scrambling are all well honed now and perhaps my focus has shifted more towards paying attention to who is on the trail and more personality related things like who I like/dont like coming to the fore. There are certainly a lot more people on the trails at the moment including more NOBO’s daily, weekend warriors and SOBO TAers just doing the South Island. 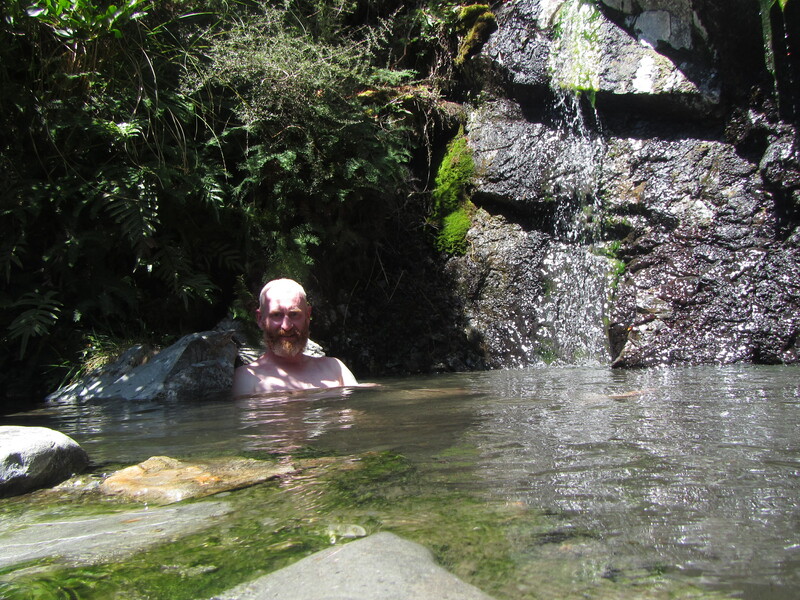 So after my quick lunch, I left Hurunui Hut and made my way towards a natural hot spring that I knew to be on the trail about 4 km away. On finding it, I had to make use of it. What a treat to have a hot bath on the trail. Who says trampers don’t wash out here. I had no fixed agenda for the day other than to push the kilometres a little bit. I had enough food for 3 days and needed to get as far up the valley as possible today to leave me two days to get to Arthurs Pass for a resupply. Pressing on I reached Hurunui Hut #3 in the early afternoon. It didn’t look that inviting, being dark and lots of holes for sandflies to get in so I moved on further up the head of the valley. Within an hour I reached Camerons Hut, a small 4 bunk hut in worse condition than the previous hut, similar to the standard of huts you might get at home in the alps. So I continued on. I came upon the first 3 wire bridge crossing o this trip but on testing it out and with wet feet already, felt it safer to just cross through the water. It was a low level water crossing and easy to do. On the 3 wire I felt like I might tip of the edge. Pressing on for another few kilometres I finally settling to camp at km 2114 after getting late in the day and no longer bothered go any further. It felt like today was just work. Hope Kiwi, no pun intended….having a great time Joanne!